What is a spray? A spray is defined as a flow of individual liquid droplets evolving in a surrounding gaseous medium. Each droplet has its own diameter and velocity and may collide and coalesce with other droplets. How do you characterize the spray? The most significant spray characteristics are the drop-size distribution, the drop-velocity distribution, the density (number of droplets per unit volume), the spatial distribution (local volume fraction), and drop temperature. What is drop size distribution? It is an information about the drop sizes and the number of droplets corresponding to that size in a spray. It is just a graph of count V/s size. From the below mentioned graph, it is evident that droplets in the size range of 16 to 55 micro meters cover the majority portion of the spray. What is velocity distribution in sprays? It is analogous to drop size distribution. It is an information about the velocity of the droplets at different locations. The figure below shows a typical Velocity distribution data for a spray. You can see that the velocity of the droplets near the center line is higher than the droplets near the spray boundary. What is D32/Sauter Mean Diameter? Sauter Mean Diameter (expressed as SMD, d32 ) is an average of particle size. It is defined as the diameter of a sphere that has the same volume/surface area ratio as a particle of interest. In other words it the diameter of a drop having the same volume/surface area ratio as the entire spray. What are the spray characteristics diameters apart form SMD? Arithmetic Mean Diameter (D10)-The average of the diameters of all the droplets in the spray sample. Volume Mean Diameter (D30)- It is the diameter of a droplet whose volume, if multiplied by the total number of droplets, will equal the total volume of the sample. Sauter Mean Diameter (D32)- It is the diameter of a droplet whose ratio of volume to surface area is equal to that of the complete spray sample. 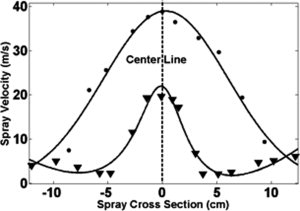 Mass (Volume) Median Diameter (DV0.5)/MMD- It is the diameter which divides the mass (or volume) of the spray into two equal halves. Thus 1/2 of the total mass is made up of droplets with diameters smaller than this number and the other half with diameters that are larger. This number is used initially to account for the influence of viscosity drop break up. The Ohnesorge number is a dimensionless constant to describe the tendency of a drop to either stay together or fly apart by comparing viscous forces with inertial and surface tension forces. Larger Ohnesorge numbers indicates the profound influence of viscosity. To account for the liquid viscosity in droplet formation, the appropriate non-dimensional number is the Ohnesorge number which represents the ratio of internal viscosity dissipation to the surface tension energy. The Ohnesorge number may be written in terms of the square root of the Weber number divided by the Reynolds number. The Ohnesorge number is sometimes also referred to as stability number, viscosity number, Laplace number, or Z number. It is independent on the velocity and therefore only adequate to describe droplet ejection in conjunction with the Weber number. The lower the Ohnesorge number the weaker are the friction losses due to viscous forces. This means that most of the inserted energy converts into surface tension energy, i. e. a droplet can be formed. The higher the Ohnesorge number the more dominant is the internal viscous dissipation. This means that most of the inserted energy converts into internal viscous dissipation. It is the ratio of disruptive aerodynamic forces to consolidating surface tension forces. Higher the Webber Number higher the deforming external pressure forces and represents greater tendency to breakup. What is critical Webber Number? It the Webber Number at which the aerodynamics forces equals to surface tension forces.